J.J. Abrams has a couple more franchises he wants to tackle. The producer-director, who is busy wrapping up “Star Trek” and tackling “Star Wars” as his next tentpole, plans to work closely with Valve to adapt the games “Half-Life” and “Portal” into films, he told a gathering of videogame creators at the D.I.C.E. Conference in Las Vegas. The projects are in early development through Bad Robot and Valve and not yet set up at a studio. Abrams made the announcement with Valve Corp president and co-founder Gabe Newell during a keynote conversation kicking off the confab that focused on the storytelling differences between films and games. Both creators agreed that there are elements of both forms of entertainment that connect with viewers and players in different ways and the two hoped to combine those as they move forward with the Valve adaptations. The projects are just the latest in a growing list of videogame adaptations set up at studios. Others include “Assassin’s Creed,” “Tom Clancy’s Splinter Cell,” “Need for Speed,” “World of Warcraft,” “Deus Ex,” “Uncharted,” “Mortal Kombat,” “Asteroids,” “Missile Command,” “Spy Hunter,” “Twisted Metal,” “Mass Effect” and “Hitman,” to name just a few. Abrams pointed out “Portal’s” slow reveal of its characters and plot as an innovative way to build a mystery. 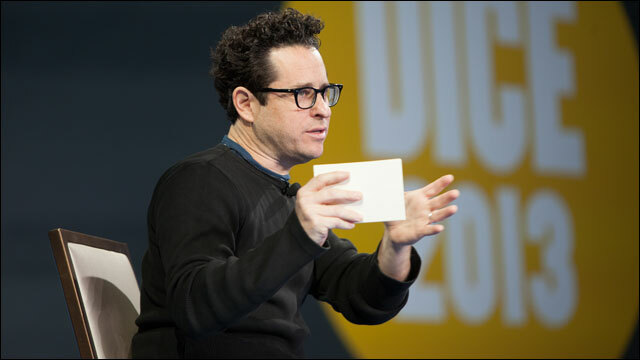 Abrams and Newell used clips from “Cloverfield,” “Half-Life 2” and “Jaws” to prove their points, with Abrams also playing a scene from his first “Star Trek” to reveal “Star Wars'” R2-D2 floating in space in a field of debris. Abrams revealed the robot as an example of giving audiences additional details to enjoy upon multiple viewings of a film. “We often ask what things can we hide that people will find over time?” Abrams said. Referring to Abrams’ “Star Wars” helming job, “So I have to go back to your movies to see what movies you’re going to direct next?” Newell asked. Newell cited Abrams’ “Cloverfield,” “Alias” and “Super 8” as brilliant projects but was frustrated in “Cloverfield” when the film’s monster first attacks New York City and a character with a camera records every step. Ultimately, interest in a movie or game will all come down to characters and their storylines. “If you don’t care about the characters, nothing matters,” Abrams said.